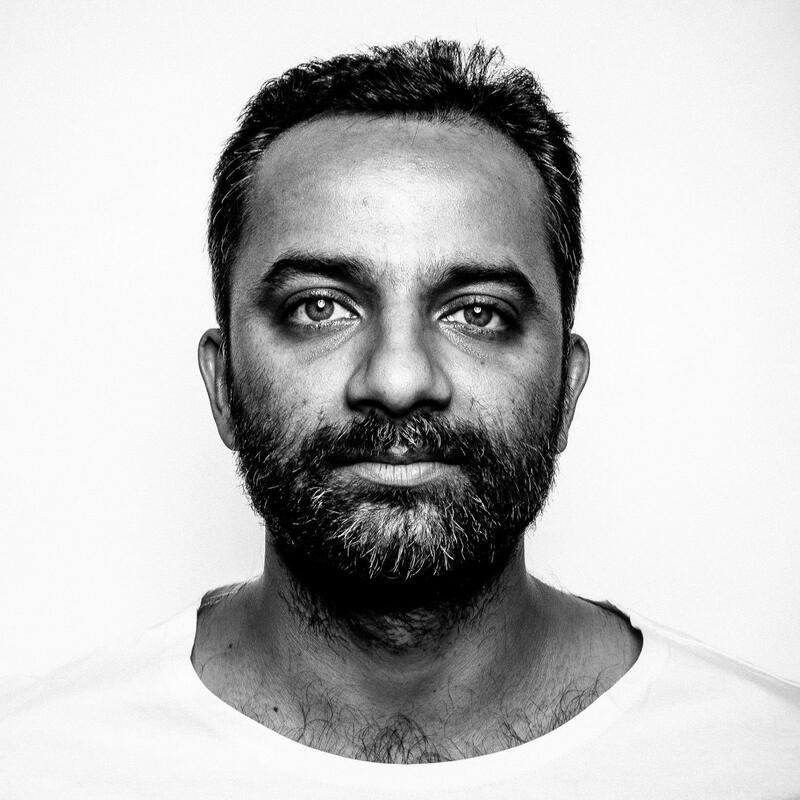 Avinash Kumar is a design strategist, researcher, artist, entrepreneur, and visual jockey with a natural inclination to build entrepreneurial projects in the arts and design department. Avinash has anchored the design studio and arts collective Quicksand for over one and a half decades. Apart from his dynamic and awe inspiring design work, Avinash is also the cofounder of BLOT(Basic Love Of Things), pioneering the visual art scene, pushing boundaries and creating his own blend of quirky, refreshing and esoteric art. His latest venture Antariksha Sanchar(Transmissions in Space) a point and click adventure game inspired by mathematician Srinivasa Ramanujan, fuses space travel, mathematics, vivid dreams, aesthetic elements from South India in the 1920’s and classical Bharatnatyam, through a collaboration with his mom Jayalakshmi Eshwar. Avinash begins the talk by differentiating the diverging modes and set ups used by various Visual Jockeys, much like music production and the performance aspect of the same, some visual jockeys are inclined towards hardware oriented rigs while some others prefer to use software and get deeper into projection mapping. It’s always the visual artists following the music in clubs and music festivals. It would make for a rather interesting change up if the same were turned on its head, where the musicians follow the visuals he adds. He explains the similarities in process and practice of his own approach to that of an electronic music producer and a DJ. Much like a DJ would dig for the freshest tunes, Avinash finds himself scouring the Internet for the most obscure and inspiring pieces of video. He also regards both forms of as an act of media activism and preservation. Whilst both cultures have a history of borrowing, Avinash elucidates on the joy of creating his own content and captivating viewers with his work, through the transformation of pixels, he transports viewers across different eras of time where one moment you could be in a classic Russian film from the 1930’s and the other, you could be walking through the streets of Barcelona. Avinash used a series of about 30,000 images that he shot himself, aligning the same in a stop motion format to create an elevated sense of the everyday world. His inspirations come from non-narrative filmmakers like Stan Brakhage , whose hand painted animations in works like stellar have been the subject of fascination for cinema buffs, visual artists and film makers alike. His influence clearly outlined in Avinash’s work, which as he puts it, does not always have to have a deeper contextual meaning, but abides to a sense of mystery and beauty in each passing frame, which could be a story in itself. It’s about what the same does to your mind, opposed to traditional media, which is trying to give you a simplified version of something. Using brightness and colours as a means of contrast in is his sets, he notes that sometimes the conflicting characteristic of the visual itself to the clubs environment can leave a lasting image in the viewers mind. Whilst rifling through different work, what generally appeals to him are the projects that trigger a sense of nostalgia and that which keep the observers involved through relatable matter. He chooses not to sync his systems clock to the music and instead manually sequences and crossfades between the scenes, to allow for improvisation on the fly. Avinash isn’t an active gamer , his approach to the project comes from a design perspective as opposed to that of a programmer, lets not forget one of the greatest video/game designers of all time Shigeru Miyamoto had a similar approach and was responsible for the best selling game(s) worldwide to date. In fact Shigeru started out as a designer of toys much like Avinash. Differentiating between shorter and longer ventures, Avinash found while working for projects in a club atmosphere, he would churn out endeavours at a much faster rate, whilst his current project Antakrisha Sanchar has been five years in the making. The advantage with longer projects is the over all freedom of not being bound by deadlines, and hence having more time to research and fine tune the details, which he found to be of a lot more value. His attention to detail, as impressive as it is obsessive, instead of looking through the Internet for images of sculptures that peaked his interest, Avinash had a team of young designers physically scout Temples and other monumental south Indian architectural structures to come back with a brief sketch, which was then to be reinterpreted for the purpose of the game. Opposed to the traditional game design approach of working solely on laptops, his team visited Karikudi and Chettinad homes to have the most authentic model to use for the game. Since the protagonist is set in a South Indian Temple town in the 1920’s, they studied the Goupuram, but disconnected the religious aspects of the same, by replacing the religious idols with microorganisms. When the team found an old horn that fascinated them in a national museum they begun to map the entire games layout, that is, the house, town, market, temple, encompassing everything through to Botanical garden on the same and translated their vision to have the map of the game forming a horn. The game features mini realms within this already dense world. Looking into the work of Ernst Haeckl, who mapped a genealogical tree relating all life forms. Replacing the religious figures of Gopuram and Meenakshi Devi with the bodies of fish and microorganisms, taking religion out of the frame but keeping the aesthetics of a pre Vedic time, invariably suggesting that the community is devoted to science, with or without their actual knowledge. The idea for the game traces back to a concept for a t-shirt about a man who travels to Mars with a mission of creating his own life form, the t-shirt depicted a rocket ship taking off in the background and a man building antras out of the animals DNA. The design and concept was then further developed with a vision of breaking the story up into five chapters, each chapter containing about an hour of content, this was then further fragmented into a series of two, two and a half hour episodes. This allows the team to work to the best of their capabilities and give each episode the time, detail and effort required to build an extraordinarily unique, immersive, and culturally rich depiction. If this weren’t enough, the game has also connected Bharatnatyam (a classical Indian dance form) and compositions from various Carnatic and electronic musicians through a collaboration with Avinashs’ mother a classical Bharatnatyam dancer who performs in plays and even teaches the art form to a group of students. It’d seem like the notions of art and preservation of culture run deep in the family, as Avinash’s uncle, a devotional singer has also been adapted as the protagonists’ grandfather in the game. Avinash wanted to depict his vision of the transformation of his mom from a housewife to a divine dancer with as much precession as possible which is what led him to use 3D technologies to capture the movements and transcribe the same meticulously to the game. The studio was asked to conduct research on the informal medical sector, comprising of quack dentists and bonesetters, to make a series of art projects, incorporating stories of the various practitioners they met. The studio had also released a short video about the same. Another project they’re working on is documenting bicycle commerce in Indian cities, the point of the same was to show the government that they are an essential part of the informal economy, not just from an economical point of view but also from a cultural and service point of view. They’re also looking at making illustrations of Arunachalam Murugunantham, the social entrepreneur who raised awareness of the unhygienic practices around menstruation in rural India and invented low cost sanitary pads to tackle the same. Furthermore the studio has undertaken a project in Cambodia, where they look to negate the use of plastic bags by identifying the consumers’ attitude and behavioural patterns towards plastic. You can have something completely different 5 years back which somehow connects today. Organically building projects up and letting the ideas come with the flow. It’s a gift to see art in the mundane and involve all of those around you in the same. Find out more about Avinash and his work various projects with Quicksand.